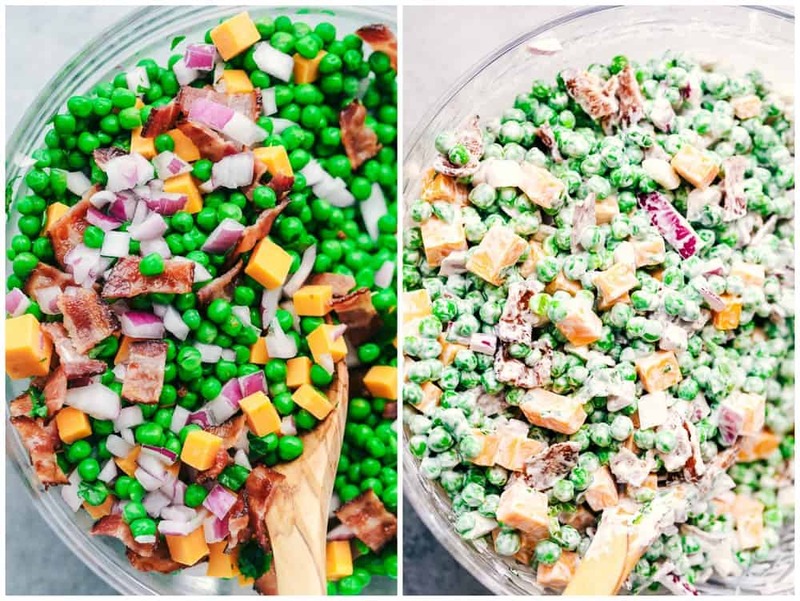 Creamy Pea Salad with Bacon is a popular southern dish that is filled with crunchy peas, crispy bacon, chopped red onions, and cheddar cheese. This is an easy to make side dish that is perfect for your next potluck! For more delicious potluck side dish ideas be sure to try California Spaghetti Salad, Ambrosia Salad, or Pistachio Salad. Peas. You either love them or hate them right? I love peas. One of the only veggies I actually like to eat. 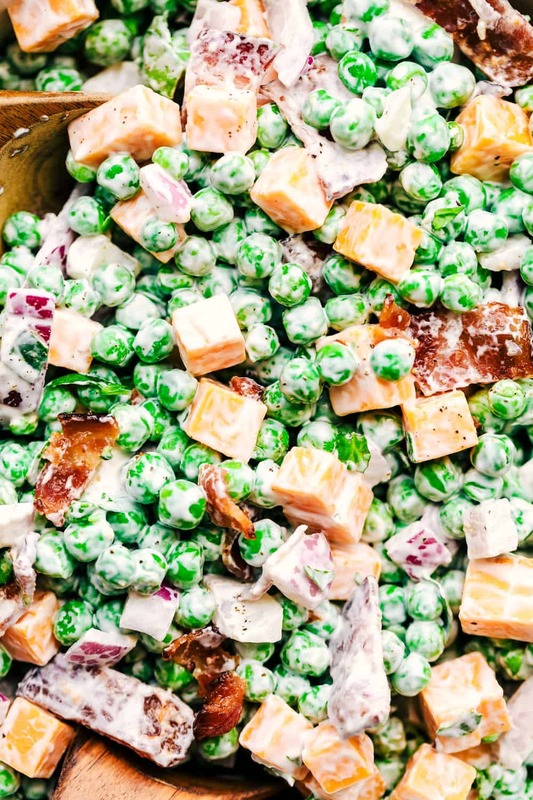 Even if you don’t like peas, this creamy pea salad is a potluck staple. I have been making some classics here on the blog lately. Ones that I have grown up with and are always at a potluck or family gathering. This creamy pea salad is one of them. It is a southern favorite and really popular. And filled with bacon, it makes it even better! I love this pea salad because it is so simple to make. I am usually in a hurry to make something quick for a BBQ and that is why I love to make this dish. You just have to add in some thawed peas, bacon, cubed cheese, and red onion and toss it in a creamy mixture. It is ready to go out the door in no time at all. How do you make pea salad? 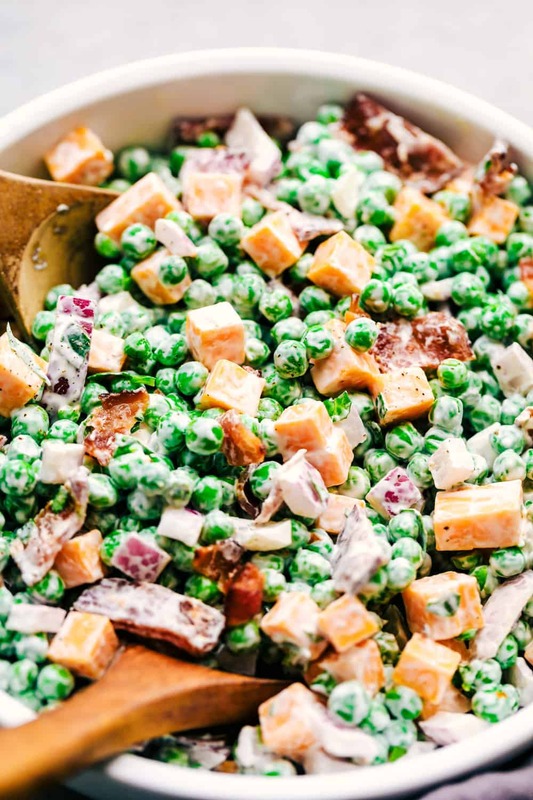 To start, add the peas, cooked bacon, red onion, cubed cheese and chopped parsley to a large bowl. Make your creamy dressing by adding sour cream, mayonnaise, cider vinegar, and sugar. Pour on top of the pea mixture and toss until it is coated. Let chill in the fridge for about 3o minutes before serving. Is it safe to eat frozen peas? A commonly asked question and yes. When you cook frozen peas, you really are just warming them up. No vegetables or fruit are bad for you when eating them raw. 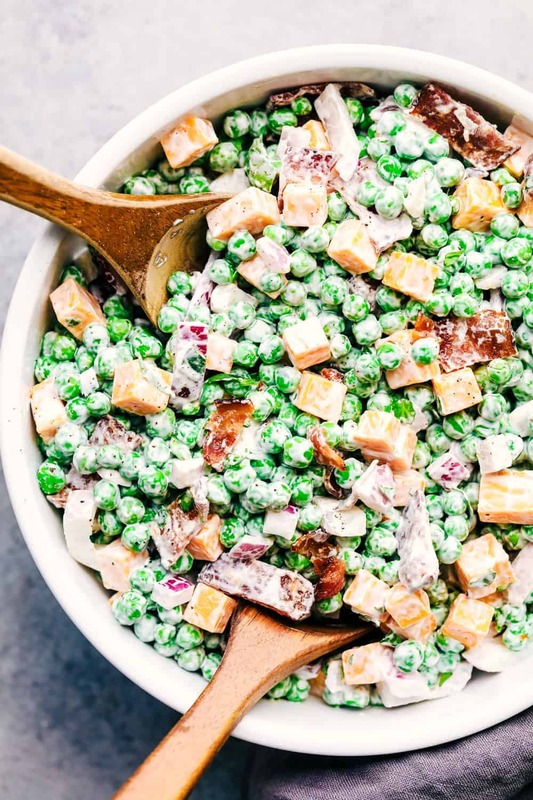 Why is this pea salad the best? 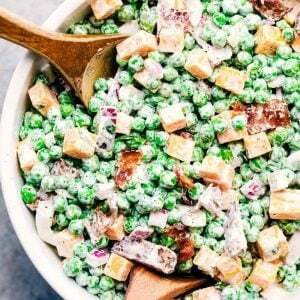 This pea salad is perfected in the creamy mixture. I have had many pea salads in my day, and come to perfect the creaminess in this pea salad. With added sour cream, a little bit of cider vinegar and a tablespoon of sugar, you will quickly agree this one is the best! Can I substitute shredded cheese for cubed? Absolutely! You can substitute shredded cheese or cubed. I just prefer to cube my cheese in my pea salad. This dish is perfect for featuring a veggie at your next gathering. Tossed with bacon and cheese in a creamy mixture, this is sure to be a huge hit! I know your family is going to love this recipe just as much as we do! 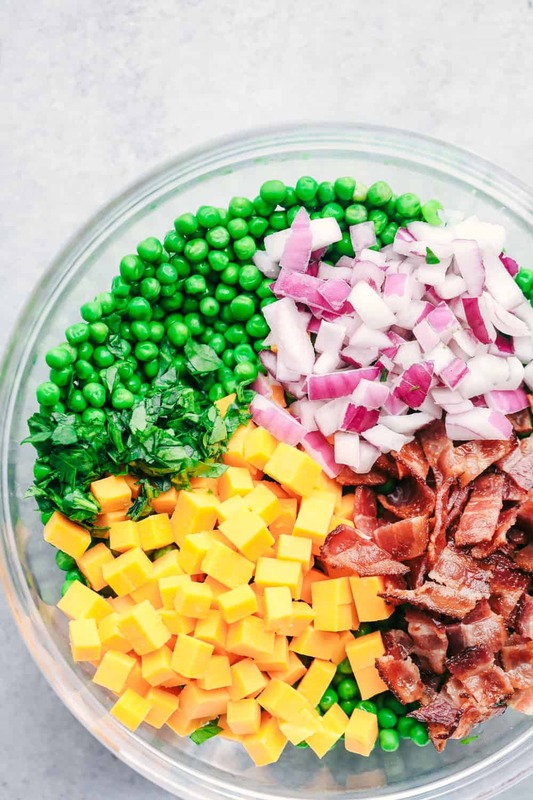 In a large bowl add the peas, red onion, cheddar cheese, bacon and parsley. In a small bowl whisk together sour cream, mayonnaise, cider vinegar, and sugar. Pour the creamy mixture in the large bowl over the peas. Toss until the peas are fully coated. Chill for 30 minutes before serving. Oh, this was a specialty of my mother’s. I miss her so; I should make this in hommage. BTW, can’t eat raw potatoes or cassava. Of course, there’s an exception to every rule. I love raw peas. Can’t wait to try these recipes. I’m new to this site. This recipe was in my email today, Sounded good so bought the ingredients and mad.e for my supper. Loved it Used Colby instead of Cheddar although it is a form of Cheddar. The only thing it needs is some black pepper. OOh, I love peas. Unfortunately my husband passed his distaste for them to my children… I guess I’ll be making this for myself then because it looks SO GOOD!! Try raw cauliflower in place of the peas!!! Truly the best pea salad I have ever made! Thank you! Can left over pea salad be frozen ? Great pea salad. Very quick and easy to make.